rising in her mouth each morning. that she was not alone in her body. 7.tight up under her heart. and remember you. He had no father. with equal and unbiased indifference. earth healer, pilot take wings. death, when he asks him for bread. for the day he draw 9.his bloody salary. and at 11.knee city she uses them. is first and last for she still throwing two hands as mother and father. She is prepared, she is done.4.Absalom. The persona in this poem is telling the story of a mother who loved her son. The mother became aware of the child's presence when she experienced morning sickness. She placed all her hopes in the child and raised him as a single parent because his father (www.bulbsoup.com) was indifferent to the child's existence. The mother had set no barriers on what the child could become, but is told that he has an employer who values him so much that he is given his own submarine gun. The son tells his mother that his employer is like a father to him, but the mother wonders at the father figure who purposefully endangers his child. She prepares for her son's death by going downtown to buy funeral apparel. The mother feels powerless, so she prays for her child and says protective psalms for him. On the other hand, she reads psalms of retribution for the employer and weeps for her son. Her situation does not look good and is likened to a partner system in which she draws both the first and the last hand. Lines 1-2: The persona emphasizes that the mother placed all her hopes in her son. When you are poor, generally, you have no prospects, you only dream and hope. 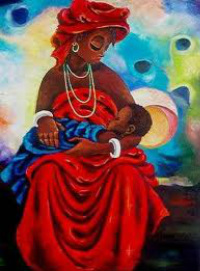 Therefore, the persona uses this metaphor to emphasize the mother's dependence on her son's success. The persona appears to praise the child's father by referring to him as 'fair-minded'. She is, however, chastising him for not only ignoring his son, but all of his other children. Lines 38-39: Psalms is a particular chapter in the Christian Bible. In this chapter there are verses for protection, the mother uses those for her son, as well as verses for retribution and rebuking. It is implied that the mother chooses those for the employer. An example of a Psalm of protection is Psalm 121, while an example of a Psalm of retribution is Psalm 109. Lines 43-45: In the Christian Bible, Judas Iscariot betrayed Jesus. Therefore, it does not bode well for the mother if she is in a 'partnership' with this person's mother (www.bulbsoup.com) because she might also be betrayed. The banker in the 'partnership' also happens to be the thief on the left hand side of the cross' mother. This also does not bode well for the mother if the apple does not fall far from the tree. This hints at the love that the mother harbours for her child. He was not simply 'close to her heart', but 'tight up' under it. It implies that the son holds a special place in her heart. This implies that the mother believes that the result of the son's 'job' will be death. The mother has no power to change her son's situation. Earth is used to emphasize her powerlessness on this level, the realm of 'reality'. This implies that the mother cried constantly for the plight of her son. The fact that it 'covers him' speaks to the high quantity of tears that were shed. This is an informal saving scheme set up with a specific number of individuals for the duration of a specific time span. Each person agrees to pay a designated figure on a monthly basis. The 'draws' are decided, meaning who gets the money first, second, third etc, on a monthly basis.The banker then collects the money and gives the monthly pool to the person who is to receive their 'draw'. Therefore, a 'partnership' is dependent upon the honesty of the banker, who could abscond with the money, as well as the honesty of the members of the savings scheme, who could decide NOT to pay after they have received their draw. 15. 'her draw though is first and last for she still throwing two hands as mother and father'. This statement implies that though the mother has the advantage of first draw as mother, she loses that advantage because she also has the role of father. Mothers cannot father sons. The fact (www.bulbsoup.com) that the son has found a father figure proves this to be true. Therefore, she has the last draw, which carries with it the disadvantage of not receiving a full 'draw'. The longer one waits for a draw is the more likely that dishonesty will come into play on the part of the participants. The mood of the poem is reflective and angry. The persona is thinking about a mother's response to her son's life choices. The tone of the poem is pragmatic, pessimistic and angry. The persona is telling the tale as it is, with no positive energy. Death, love, survival, desires/ dreams, childhood experiences.